Prime Minister Binyamin Netanyahu’s skilled oratory last week at the UN (click here to watch the speech), climaxed his highly successful global campaign to convince the Western world that a nuclear Iran controlled by messianic mullahs would not merely impact on Israel but would have catastrophic consequences for the entire civilized world. It was largely due to his unremitting warnings and threats of unilateral preemptive action, that the US and Europe belatedly imposed sanctions and began paying lip service to utilizing military force as a last resort should sanctions fail to impact. Unfortunately in the midst of this, a number of disgruntled former Israeli intelligence chiefs began publicly casting doubt about Israel’s capacity to confront Iran alone. Whether they were right or wrong cannot be confirmed. But their irresponsible outbursts did reassure the Iranians that Netanyahu was bluffing and discouraged the US from adopting a tougher stand. Regrettably Obama’s track record of resorting to decisive military action is dismal and despite his assurances that the US would never enable the Iranians to attain a nuclear military status, it is hard to visualize this administration undertaking decisive military action on its own initiative. 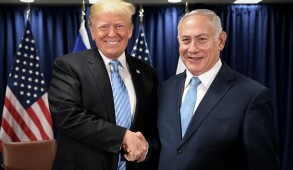 Netanyahu therefore pleaded with Obama to draw red lines in relation to Iranian nuclear development, which when crossed would either enable Israel to act or result in the United States itself making a military move. Obama cynically dismissed Netanyahu’s pleas as “noise” which he pledged to block out. His simultaneous reference to Israel merely being “one of our leading allies in the region” signaled that he no longer felt obliged to pursue his “charm offensive” towards the Jews in relation to Israel. That was further confirmed when he snubbed Netanyahu by refusing to meet him in the course of his visit to the US, despite finding time to appear on TV talk shows. With the threats currently confronting Israel at so many levels, it is not surprising that most Israelis united in support of their Prime Minister. Needless to say these pathetic attacks were quoted by the increasingly hostile liberal American media as well as left-wing American Jews who began chanting their mantras about “Bibi interfering in domestic US politics”. One leading Jewish American commentator made the absurd statement “I’ve never seen an Israeli PM who has so mismanaged Israel US relations”. This even emboldened a number of Democratic Congressman to voice their condemnation of Netanyahu. Undoubtedly, Netanyahu would prefer Romney, who consistently expresses support for Israel, to become president rather than Obama, who personally loathes him and exhibits little positive chemistry towards Israel. 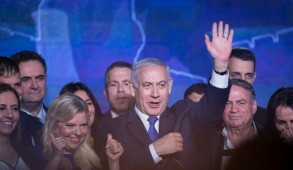 But the reality is that Netanyahu has assiduously avoided engaging in the US presidential elections and on occasion, even lavishly praised Obama. It is surely outrageous to accuse the PM of Israel of meddling in US domestic politics because he relates to the need to impose red lines on an issue that has genuine existential implications for his country. The United Nations reflects the prevailing global malaise. Last Monday, Ahmadinejad bizarrely attended a UN summit on “the rule of law” where he accused Israel of being a “fake regime” which “will be eliminated”. Two days later on Yom Kippur, representatives of all U N nations – other than the US and Canada – listened respectfully whilst the genocidal holocaust denier, a brutal dictator, preached morality to them. 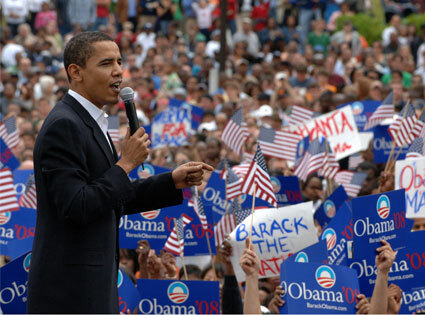 President Obama’s subsequent address dealt primarily with the Muslim riots. Much of it condemned the crude anti-Islamic film, for which the US was never responsible. Yet he only made passing mention of the state sanctioned hate propaganda against Christians and Jews which dominates the Islamic world. In relation to Iran, despite failed US diplomacy, he not only omitted any reference to red lines but even failed to state – as he had in the past – that all options were open if the Iranians continued their drive towards nuclearization. The following day, Palestinian President Mahmoud Abbas accused Israel of criminal activity and threatened a new intifada unless Israelis capitulated to his demands. This followed his earlier meeting with Alan Dershowitz and a few other naive Jews to whom Abbas had pledged he would take a more moderate line towards Israel. He was followed by Israel’s Prime Minister Netanyahu who bent over backwards in his UN address to be bipartisan, thanking Obama, ignoring his snubs and playing down any tension between them. 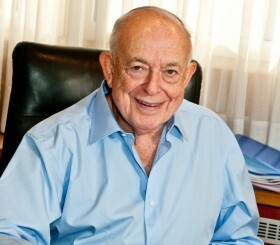 He claimed that the objective of both Israel and America was to act as a barrier against “the forces of medievalism which seek a world” in which death rather than life is glorified” He warned of the dangers of a “nuclear armed Al Qaeda” and predicted that “red lines”, would prevent rather than lead to war. 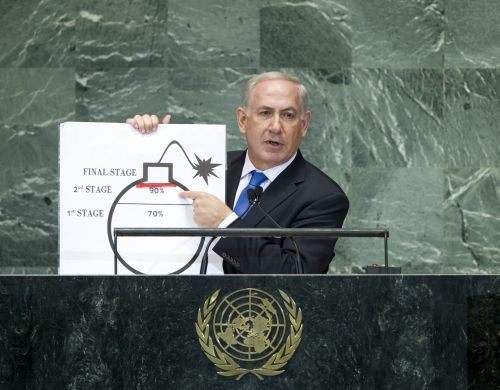 He visually displayed a red line on the sketch of a bomb with a fuse to illustrate Iran’s progress in amassing sufficient enriched uranium to make a nuclear bomb which he predicted would be achieved by the summer of 2013. The sketch was denigrated as childish by churlish Israeli politicians and much of the liberal media but proved to be extraordinarily effective and received wide exposure. We face difficult times. Despite reassuring statements made by both parties, there is no denying that the US-Israel relationship is exceedingly fragile. There is a mutual lack of confidence between President Obama and PM Netanyahu. 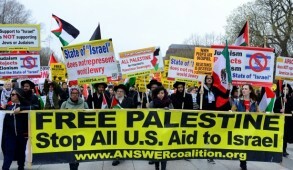 All the White House seeks from Israel are further concessions being extended to the Palestinians. In the meantime, whilst the Middle East region is undergoing profound upheavals, the Iranians are enjoying the spectacle of Big Satan and Little Satan sparring with one another as they progress relentlessly towards their nuclear objective. Understandably, many Israelis are deeply concerned with the prospect of Obama being reelected and seeking to impose indefensible 1949 armistice lines as his first step to implementing Middle East peace. 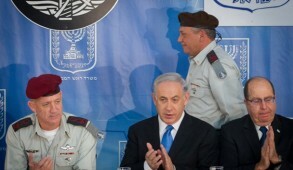 To be an Israeli leader is a thankless task. Our most important objective must now be to set aside minor differences and on this occasion unite in support of our government and Prime Minister Netanyahu. There is an enormous reservoir of goodwill to Israel amongst Americans at the grass roots level. If they see that our PM speaks on behalf of the overwhelming majority of his citizens on this issue, they will realize that the allegations against him meddling in US domestic politics are simply untrue. It will also encourage them to pursue their own interests by exerting public pressure on their politicians to tighten the screws and take whatever measures necessary to forestall the global Iranian nuclear threat.